Hess has been around for a while. They started out as a nanobrewery and for a long time were one of the smallest breweries around the Mira Mesa area. Slowly but surely they expanded their reach and this year they opened a brewery in North Park. 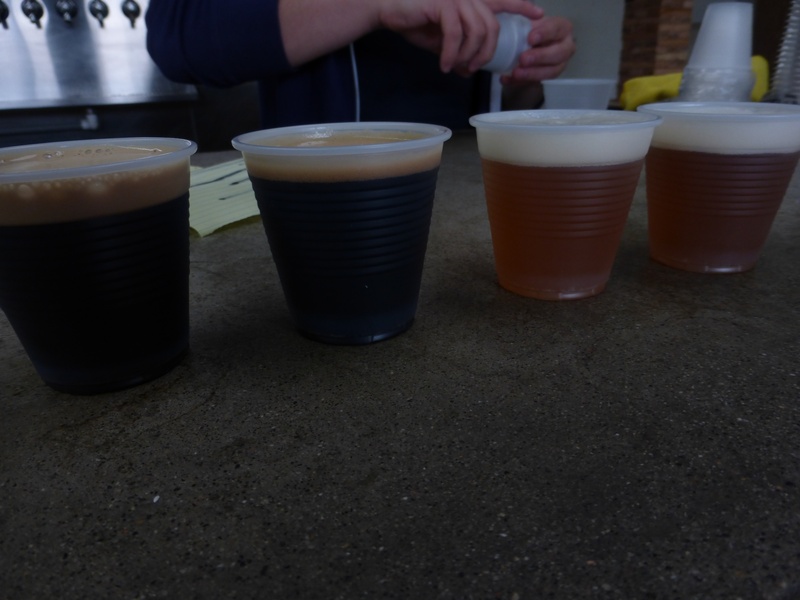 Sadly, the Mira Mesa tasting room still uses plastic cups for the tasters and they charge a premium for the chance to get your tasters in a glass. Considering that some of the smaller breweries out there use glass for their tasters it seems a bit quaint that they would stick with this route. Part of why I didn’t go back since my last visit was the plastic cups used for everything. 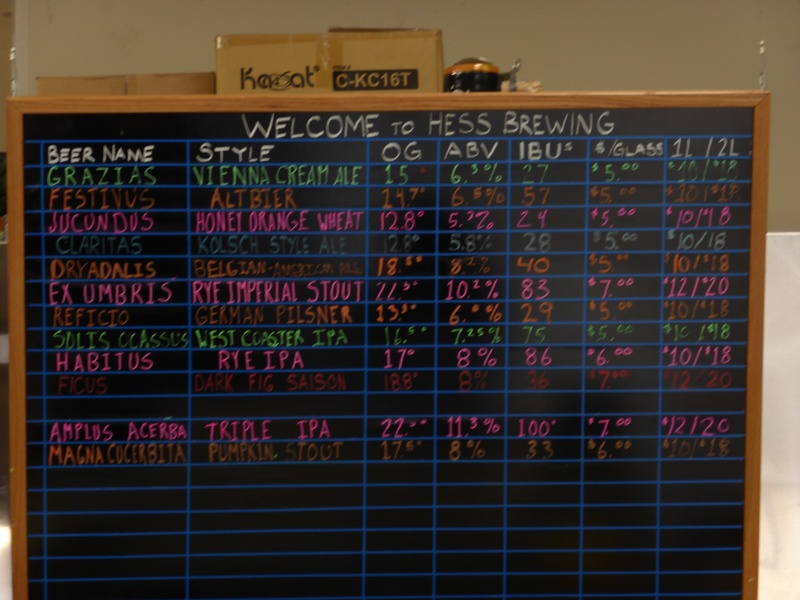 Hess tap list as of 11/30/2013. Beer wise, Hess has an interesting selection. They are not the place to go if you like heavy hop flavors in your beers. Today I got to try a few tasters because the selection was so large that I couldn’t possibly try everything, though I am not sure I will go back to finish out the rest. The Pumpkin Stout was interesting and I had it both on tap and on nitro. Though it has a nice creamy flavor it was not particularly impressive. There wasn’t a lot of pumpkin flavor in the beer to make it stand out from the rest of the pumpkin beers, and also not much spice flavor either. Still, as a stout it was really good even if it did not have the flavor to match its high 8% abv. The IPA was interesting in that it wasn’t insanely malty like some and wasn’t insanely hopy either. So it was a nice balanced brew and had some solid hop flavors. Still, it did not do enough to compete with some of the better IPAs I have had recently, especially the Perseus IPA from Intergalactic. The Belgian American Pale was the standout from what I had this day. It has the sweet flavors of a Belgian beer with the added bitterness of a pale. I wasn’t about to order a pint in plastic cups though. I finished off with a taster of the Rye Imperial Stout. It had a solid stout flavor with the chocolate flavors but did not really impress me compared to other similar beers I have had recently. 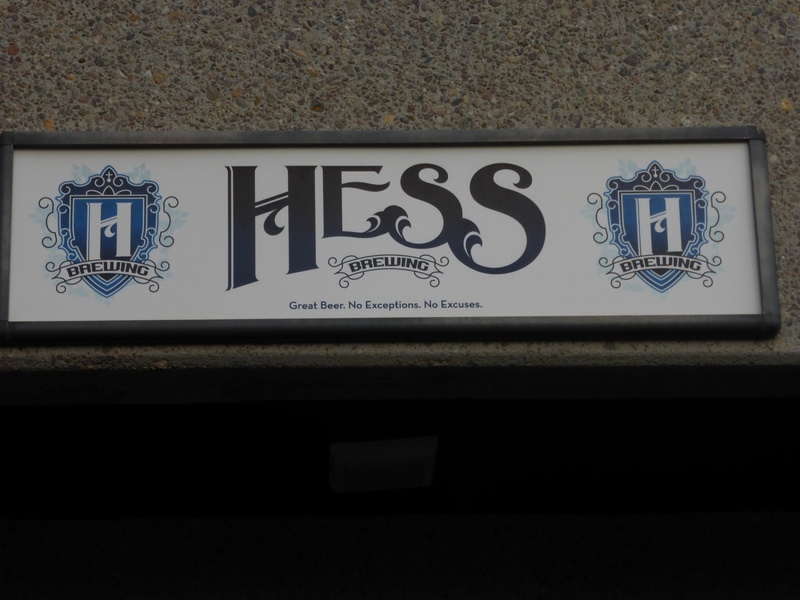 Compared to some of the upstart breweries around here, I would suggest you give Hess a try if you like the Belgian flavors. Hop heads should look elsewhere for now. I probably won’t be back until they start using glasses.